Now that we’re more than a year and a half into rock ‘n’ roll’s lifespan and the style has shed many of its most dated elements that at times had tied it uncomfortably close to pre-existing genres, be it pop or jazz, and has solidified its own stylistic parameters that are unique to it as a standalone form of music you might be asking yourself what exactly we’re doing revisiting the decidedly pop-oriented pre-rock group The Four Tunes? The Four Tunes – as we’ve stated before when we met them – were done in by their unfortunate timing (well, unfortunate if you happened to be a rock fan, but probably very fortunate if you happened to detest rock and wanted them to shun it wholeheartedly… though what you’d be doing HERE on this website escapes me). 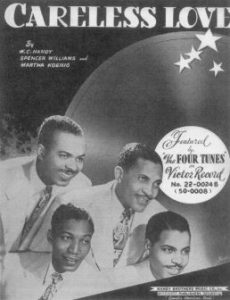 They burst onto the scene before rock had a chance to be conceived and as such their avowed models – not to mention the source of their own origins – were The Ink Spots. 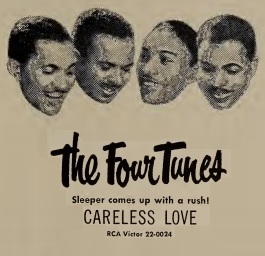 That The Four Tunes managed to score hits in that realm meant there would be no need, nor excuse, to delve into the unruly sounds of rock ‘n’ roll when it came into being in late 1947 in the hopes of making headway with their careers. Their careers were doing just fine without rock ‘n’ roll and so it would seem that the two would never cross paths. But they already have in large part due to two factors they could hardly escape. One was the fact they were African-American and the natural vocal attributes they suppressed to a degree when aiming squarely at the pop market were bound to come out with just a little encouragement. That encouragement came via the second factor, which was the success of black rock vocal groups such as The Ravens and The Orioles which made this a field potentially worth getting into for them as well. The fact that both The Ravens and Orioles had straddled the stylistic fence, releasing pop songs and arrangements alongside their rock output hadn’t seemed to hurt their standing too much amongst rockers (though it’s worth noting that their pop sides performed dreadfully by comparison), so the possibility that The Four Tunes, already well established as a pop act, could cross over in a backwards route to potentially appeal to the rock crowd was at least worth trying. After all, sales are sales and with two sides to a record it couldn’t hurt to double your chances. But whether that was the actual thinking or whether this was just a case of them naturally putting a little more rhythm and a little more soul into their performance on a song well suited for such embellishment, nobody can know for sure. What we DO know is that Careless Love has been mined by many a rock artist in the years since and so it’s only natural that we, having absorbed those renditions over the ensuing seven decades, might hear something reasonably indicative of a rock approach when listening to this with an open mind. There are some songs that are seemingly indestructible warhorses for a variety of styles. Careless Love may be at the top of the list. A blues standard dating back to the 1800’s the definitive version came about in 1925 when done by the legendary Bessie Smith with Louis Armstrong in support on cornet. It’s one of the truly classic performances captured on record from any era and in any style. Naturally this meant it’d be tackled by a wide array of artists and in most cases when someone of the stature of Smith and Armstrong had already laid down a transcendent take any attempt to update it would be folly. Not so with Careless Love. Everyone who tried their hand at it seemed to bring something unique to it that made it work in a wide array of styles, from bluesman like Lonnie Johnson, Blind Boy Fuller and Josh White to Bill Monroe’s wild bluegrass version in the 1940’s and George Lewis’s classic Dixieland version which helped to make it such a New Orleans favorite over the years. Our old friend Big Joe Turner cut it many times in his career and in the future everyone from Joan Baez, Ray Charles and Eddy Arnold to Fats Domino, Pete Seeger and Madeleine Peyroux took a swing at it with pretty good results. One of the best versions came with Nat “King” Cole playing W.C. Handy (the credited, but disputed, composer of this tune) in the 1957 film St. Louis Blues who sings it on screen before Eartha Kitt takes over and injects an airy seductive quality to it with Cole playing piano and briefly harmonizing behind her, something that by all rights should be seen as well as heard to fully appreciate the quality of their performance. So it certainly can’t be said that there’s been a shortage of skilled artists who’ve sought to make it their own in some way. Yet even with such ample competition over the years The Four Tunes do more than hold their own against most versions in what is arguably their best performance of a raft of recordings made during the 1940’s and in the process show that they were never quite as far away from being able to make the full-time leap to rock ‘n’ roll had they just made up their minds to do so. We can debate how much their pop sensibilities shaped the approach they take here as there are certainly some vocal inflections that are from the school of exaggerated emphasis which was a way in which black pop acts of the forties took the edge off the suggestiveness of their deliveries, sort of an airy open mouthed reach for the upper register, but while that often sinks a record’s effectiveness to our ears (see any number of Maithe Marshall passages on otherwise strong efforts by The Ravens) here that’s not a problem. Maybe it’s because the song itself is so strong, the melody so familiar, the sentiments so perfectly crafted, that we overlook it a bit more, but I don’t think that’s the case, for there are other renditions over the years that stumble over the song with ill-chosen deliveries. No, here I think they were just really motivated by the possibilities of the song and weren’t content to mail in a typical interpretation for the pop masses. Everything about this arrangement is well conceived and surprisingly modern, even at times – (dare I say it) – cutting edge! The record starts with the wordless cries of tenor Danny Owens backed by rhythmic chanting by the others. From there it’s Owens, not the usual frontman baritone Pat Best, who takes the lead, his voice effortlessly switching registers throughout from a soulful low tenor to a soaring falsetto. Throughout it he never steps wrong, always maintaining a firm grip on the beautiful melody which in this version is emphasized entirely by the voices, not instruments, as the accompaniment is rather sparse, though with drums providing a nice subtle backbeat which helps carry the song along. It’s a masterful vocal performance, easily on par with any of the best leads from Jimmy Ricks or Sonny Til we’ve seen so far. It was also Owens first lead with the group, though he’d joined them a few years earlier making him the last of the unit to become a full-fledged member. As good as Pat Best could be it’s hard not to envision Owens taking them even higher if given the chance, or at the very least giving them, like The Ravens now and everyone from The Flamingos and The Beach Boys to The Temptations and New Edition in the future, the ability to use different leads for different type songs. The other members are hardly left out as the arrangement throws in an unexpected stop-time bridge that they take in tandem with the closing lines taken solo by bass Jimmy Gordon. That part might seem a bit gimmicky on the surface but they add a clapped beat behind them which keeps the pace moving and your shoulders grooving. As such the song is wonderfully re-imagined. The sentiments remain the same, a sad rumination on the affairs of the heart, but the delivery breathes new life into it, casting out the weight of sorrow it usually employed and replacing it with a sort of wistfulness that suggests the narrator may have lost this round in love but wasn’t going to be dissuaded from trying again in the future with somebody else. That hint of optimism further ties it in with rock’s mindset and when coupled with the surprising pace and Owens’ genuine emotional commitment to what he’s singing makes the results almost startlingly fresh. Of course for all of its unexpected joys we have to once again consider the context, the all-important final element of determining a record’s value on the scene at the time it came out and here’s where we have to pull back on the reins of enthusiasm just a little. As well done as this is, from the vocals to the arrangement, and as much as it fits into the larger rock landscape that was now fully entrenched, Careless Love wasn’t going to define it. In fact had other rock groups followed their lead on this the vocal group avenue of rock ‘n’ roll that would soon prove to be so vital in shaping its future would’ve eventually been severed from the rest of the body or it’d have taken over like a form of musical cancer and killed it. While The Four Tunes showed more of the attributes needed to connect with rock on this than they’d ever shown before, and possibly would ever show again, it was done with such a lightness of touch, a measure of subtlety that may have worked here thanks to a perfect song and stripped down accompaniment, those same attributes under normal circumstances would’ve been tempered even further had this connected with audiences, dragging the rock vocal group mindset back towards the pop world in the process. In order for rock vocal groups to distance themselves from the pop field they’d have to accentuate the differences even more, MUCH more in fact, and should something like this, as good as it is, get out in front and give those other groups, those which already exist and those still to follow, the idea that this approach was a viable route to take then it stands to reason that the more radical experiments that eventually did take hold would not have been needed and thus never fully explored. Still, all things considered, it’s a blast to hear The Four Tunes manage what so few other acts over the last seven decades have truly been able to do, which is straddle that divide without alienating listeners of either side. 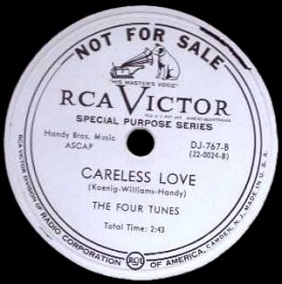 Careless Love remains a record that fits in rock even as the group which sang it never would be able to remain there comfortably. It provides a template for other artists, both vocal groups and solo acts alike, to see just how they can successfully bridge the chasm between styles without falling into the abyss that lays between them in the process. Mostly it shows what a group of talented singers can do with one of the most artful musical compositions of modern times. As an example of the best rock itself has to offer, it understandably has to fall a little short of perfection. But as an example of perfection on the outskirts of rock it’s a sublime moment that deserves to be appreciated. 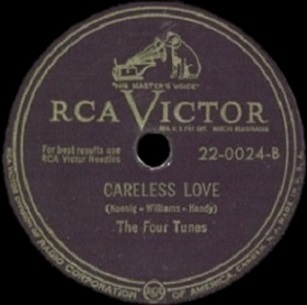 Leave a reply on "The Four Tunes: “Careless Love”"